Cytochrome P450 3A4 antibody recognizes the cytochrome P450 3A4, also known as 1,8-cineole 2-exo-monooxygenase, albendazole monooxygenase, albendazole sulfoxidase, or taurochenodeoxycholate 6-alpha-hydroxylase. Mouse anti Human cytochrome P450 3A4 antibody recognizes cytochrome P450 3A4, also known as 1,8-cineole 2-exo-monooxygenase, P450-III, steroid inducible, albendazole monooxygenase, albendazole sulfoxidase, cytochrome P450 3A3, cytochrome P450 HLp, cytochrome P450 NF-25, cytochrome P450, subfamily IIIA (niphedipine oxidase), polypeptide 3, cytochrome P450, subfamily IIIA (niphedipine oxidase), polypeptide 4, cytochrome P450-PCN1, glucocorticoid-inducible P450, nifedipine oxidase, quinine 3-monooxygenase and taurochenodeoxycholate 6-alpha-hydroxylase. Encoded by the CYP3A4 gene, cytochrome P450 3A4 is a member of the cytochrome P450 superfamily of enzymes. The cytochrome P450 proteins are monooxygenases that catalyze many reactions involved in drug metabolism and synthesis of cholesterol, steroids and other lipids. This protein localizes to the endoplasmic reticulum and its expression is induced by glucocorticoids and some pharmacological agents. This enzyme is involved in the metabolism of approximately half the drugs in use today, including acetaminophen, codeine, cyclosporin A, diazepam and erythromycin. The enzyme also metabolizes some steroids and carcinogens. CYP3A4 is part of a cluster of cytochrome P450 genes on chromosome 7q21.1. Previously another CYP3A gene, CYP3A3, was thought to exist; however, it is now thought that this sequence represents a transcript variant of CYP3A4. Alternatively spliced transcript variants encoding different isoforms have been identified (provided by RefSeq, Feb 2011). 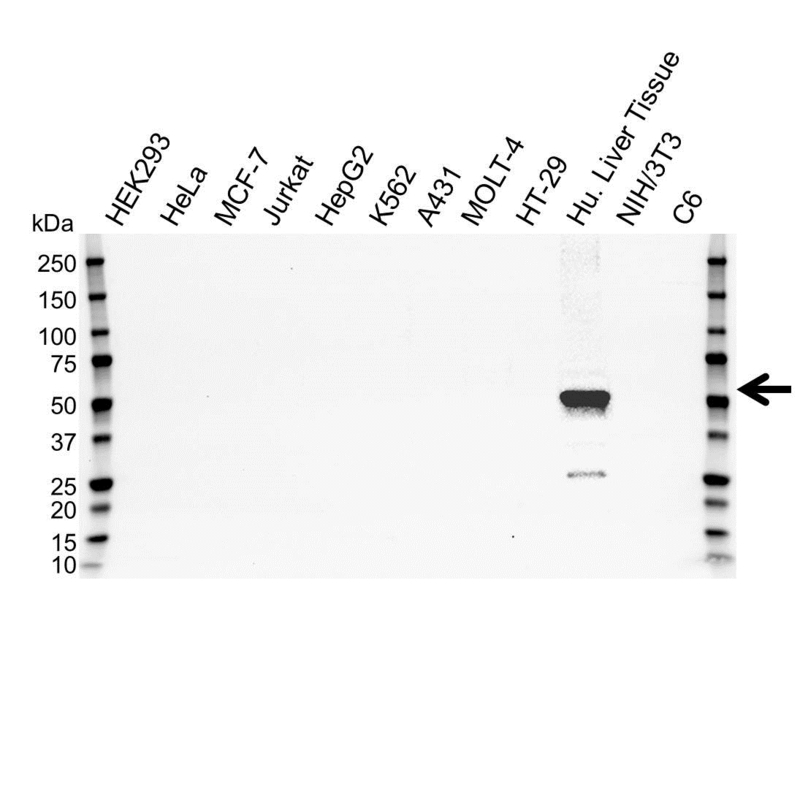 Mouse anti Human cytochrome P450 3A4 antibody detects a band of 50 kDa. The antibody has been extensively validated for western blotting using whole cell lysates.